Muonio is a municipality of Finland.The town is located in far northern Finland above the Arctic Circle on the country's western border, within the area of the former Lappi province. 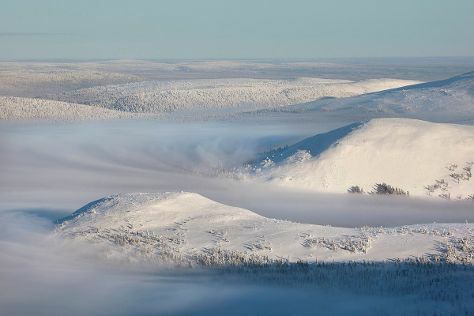 Kick off your visit on the 28th (Fri): ski along the peaceful trails at Pallas-Yllastunturi National Park. To find ratings, more things to do, traveler tips, and other tourist information, go to the Muonio trip planning site . Nottingham, UK to Muonio is an approximately 16.5-hour flight. You can also drive. Traveling from Nottingham to Muonio, you'll lose 2 hours due to the time zone difference. Plan for colder temperatures traveling from Nottingham in December, with highs in Muonio at -7°C and lows at -17°C. Finish your sightseeing early on the 28th (Fri) so you can travel to Helsinki. Visiting Aurinkolahti Beach and Hietaranta Beach will get you outdoors. Do some cultural sightseeing at Rock Church and Helsinki Cathedral. There's still lots to do: brush up on your military savvy at Sea Fortress Suomenlinna, wander the streets of Ullanlinna, take an in-depth tour of Seurasaari Island and Open-Air Museum, and contemplate in the serene atmosphere at Uspenskin Cathedral (Uspenskin Katedraali). For reviews, where to stay, other places to visit, and other tourist information, refer to the Helsinki travel planning site . The Route module can help you plan travel from Muonio to Helsinki. When traveling from Muonio in December, plan for a bit warmer days and much hotter nights in Helsinki: temperatures range from 3°C by day to -3°C at night. Cap off your sightseeing on the 31st (Mon) early enough to travel back home.